On a recent sweltering afternoon in Las Vegas, the action at the sports book at Mandalay Bay seemed cool — there was baseball and horse racing, but the NFL preseason had just begun and the NBA preseason was weeks away. Javi Sulaiman and Emily Force, visiting from Los Angeles, won $100 on a Cubs game earlier in the day, and placed another bet they refused to disclose out of superstition. Sulaiman, 43, said that when he was in his early 20s in Milwaukee he was a "small-time bookie" — a business that involved mostly friends — and recalled that when he was a college student in San Diego he and his friends would drive across the border to Tijuana, Mexico, bet on baseball and drive back and attend classes the next day. Such trips across the border may not be necessary in parts of the United States in the near future. After the Supreme Court in May overturned a 1992 law prohibiting states from legalizing sports gambling, several states have already legalized it, and others are considering it. If Massachusetts legalizes sports betting — and a lawmaker there has said it should be studied — Force, 32, who is from that state, said she would support the move. "I feel like it's safer if it's legal," she said. The American Gaming Association, a gambling trade group, has estimated that there is a $150 billion illegal sports betting market in the United States, which proponents of legalization point to as evidence that sports betting is already occurring. Officials in several states and some experts say that even if states don’t experience a windfall in new taxes after legalizing sports betting, reducing that illegal market is worthwhile, not only to raise tax revenue, but also to protect bettors when disputes arise. But the nature of sports betting in the U.S. is likely to vary by state. Some lawmakers want to emphasize mobile gambling, while others are taking a more wait-and-see approach. Some states, like Pennsylvania and Rhode Island, have opted for relatively high taxes, while lawmakers in two other states are considering controversial "integrity fees" paid to sports leagues for monitoring unusual betting activity. And MGM, a major casino owner and operator, recently announced a "historic" deal with the NBA to provide data to bettors. "I think most people thought it would be, you know, probably like 20 states coming out with legislation and it would be passed immediately in several states," said Jennifer Roberts, law professor at the University of Nevada, Las Vegas, and associate director of the International Center for Gaming Regulation at the university. "But I think that some jurisdictions are taking it a little slower," she added. Roberts estimates that in five to 10 years around 20 to 30 states could have legalized sports betting. If high taxes or other hurdles keep overseas companies offering better odds or bets, "people are not going to move from the illegal market to the legal one," said Sara Slane, senior vice president for public affairs for the American Gaming Association. The Supreme Court's 6-3 ruling in May overturning the 1992 Professional and Amateur Sports Protection Act, a law that did not ban sports gambling nationwide but said states were not allowed to permit it, opened the door for states to allow wagering across the country. Here’s a look at the actions states have taken since the ruling, with details on which states have moved quickly to permit sports betting, which ones are studying the issue and which ones are staying on the sidelines for now. These states have legalized sports betting, but not all have yet begun accepting wagers. Nevada has long been the only state in the country where gamblers could legally place wagers on sports. The state was grandfathered in when the Professional and Amateur Sports Protection Act was passed. Delaware was the first to accept sports betting after the Supreme Court’s May 14 decision, allowing it at all three casinos in the state starting on June 5. Gov. John Carney, a Democrat, placed a $10 bet on the Philadelphia Phillies to beat the Chicago Cubs on that day, and he won, Delawareonline.com reported. New Jersey, which brought the lawsuit that brought down the federal law, was the second state to accept bets after the Supreme Court’s decision. Gov. Phil Murphy, a Democrat, signed a sports-betting bill into law on June 13, saying it could bring in $13 million in tax revenue in the first year. He made the first official bet at Monmouth Park the next day, wagering $20 on Germany to win the World Cup (tough luck on that one), as well as an identical amount that the New Jersey Devils would win next year’s Stanley Cup (to be determined). Pennsylvania passed a sports-gambling bill in October 2017 in anticipation of the Supreme Court’s ruling, but betting in the state has not yet begun. On Aug. 17, Hollywood Casino at Penn National Race Course near Harrisburg became the first casino to submit a petition to request offering sports wagering, a gaming control board spokesperson said. But it appears that sports bets will not be taken there before the start of the NFL regular season. The Pennsylvania Gaming Control Board’s next meetings are Sept. 12 and Oct. 3. Pennsylvania has a relatively high tax on sports gambling — 34 percent on operators’ revenue plus a 2 percent tax that goes for local grants to counties, as well as a onetime fee of $10 million. A spokesman for Penn National Gaming Inc. said the company continues to have concerns about the tax rate but "the best way to do that here is to share our experience" with the Legislature. West Virginia passed a bill allowing sports gambling and Gov. Jim Justice, a Republican, signed it in March. The West Virginia Lottery anticipates that bets will be accepted at casinos around Sept. 1, before the start of the NFL season. All five casinos in the state plan to offer sports wagering, bringing in about $5.5 million in the first year, said Danielle E. Boyd, the lottery's general counsel. Mississippi changed its law in 2017 to allow sports betting, and in late June gaming regulators determined it would be legal on July 22, Gaming Commission Executive Director Allen Godfrey said. But because casinos have to apply for permission and set up operations, bets were not taken on July 22. The Beau Rivage Resort & Casino in Biloxi announced on Twitter last month that its sportsbook would open on Aug. 1. Gold Strike Casino Resort in Tunica also said its sports books were open beginning on Aug. 1. Other casinos in the state have said they would open sports books soon. In June, Rhode Island passed a budget allowing sports betting at Twin River Casino at its existing Lincoln property and a Tiverton location expected to open later this year. Sports betting is expected to begin on Oct. 1; the legislature projects it will bring in about $23 million in fiscal year 2019. A New York bill passed in 2013 that authorized sports betting at four upstate casinos if the federal law changed, and it did. But bets are not yet accepted, pending the adoption of regulations by the New York Gaming Commission. And the state has not yet voted on expanding sports betting to all casinos, racetracks and off-track betting across the state. Assemblyman Gary Pretlow, a Democrat, who is up for re-election, plans to reintroduce a bill to legalize sports betting in the next legislative session that begins in January, his legislative analyst, Kaitesi Munroe, said. Many other states have proposed bills to legalize sports betting since the Supreme Court's decision, but none have become law yet. A bill passed in Michigan’s House of Representatives that would legalize and regulate internet gambling — not legalize sports betting — but it still needs approval in the Senate. Republican Rep. Brandt Iden plans to introduce a bill this fall that would take the next step and legalize sports betting, potentially including college sports. But it's unclear if the bill will pass, and Michigan Gov. Rick Snyder has not commented on it. The constitution of the largest state in the nation by population forbids sports gambling, but Democratic assembly member Adam Gray has introduced a measure to change that. The constitutional amendment, proposed in July 2017, would authorize the state Legislature to permit sports gambling. The proposal is currently before a committee; it would need to be passed by the state Legislature and then approved by voters. Connecticut passed a bill in 2017 that called on the state Department of Consumer Protection to start preparing regulations in the event that sports betting is allowed under federal and state law. The state Legislature would have to take the next step and legalize sports betting, Lora Rae Anderson, a spokesperson for the state Department of Consumer Protection, which oversees the Gaming Division, said. The state is in negotiations with two federally recognized Native American tribes in the state about sports betting — there is Native American casino gaming in the state, as well as forms of off-track betting — and should an agreement be reached it would go before the Legislature for its approval, a spokesperson for Gov. Dannel Malloy said. Then any approved agreement would need to go to the Bureau of Indian Affairs. Malloy, a Democrat, said last week that he told legislative leaders that "it's possible that an agreement could be reached" and that legislation could be called upon. Malloy has said he is willing to call the Legislature into special session should an agreement be reached. Several bills involving sports betting were introduced in Illinois in the last session, but none went anywhere. The issue is likely to be raised again after the November election, said Caleb Melamed, legislative liaison for the Illinois Gaming Board. Indiana saw two bills introduced, one in the Senate and another in the House, that would have cleared the way for sports betting to be authorized at riverboats, racetrack casinos and other satellite facilities. But the legislative session ended in March without action. 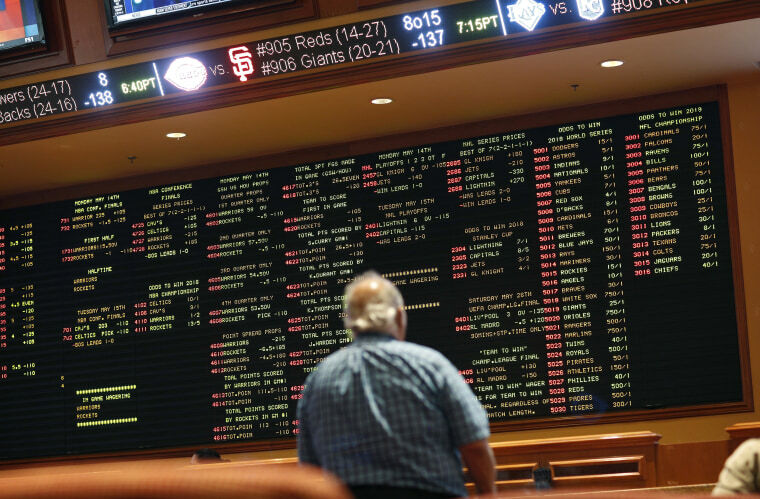 A House bill introduced in the last legislative session would have legalized sports betting in the event the Supreme Court overturned the federal ban, but the session expired. State Rep. Jake Highfill, a Republican, told The Des Moines Register in May that he will introduce a bill in 2019 that would legalize betting on college and professional sports. One bill introduced in February that would have allowed the state lottery to offer sports betting at state-owned casinos, over the internet and with mobile apps, died in committee. The House won’t be back in session until January. Republican State Rep. Jan Kessinger told NBC affiliate KSHB of Kansas City in May that a bill could be approved in January. A bill was introduced in Kentucky's legislature in January that would have required the Kentucky Horse Racing Commission to institute a sports wagering system in the event that the federal law was changed. There was no full vote on the bill before the legislative session ended. In June, a bipartisan group of lawmakers began laying the groundwork for a new sports betting law following the Supreme Court decision, NBC affiliate WAVE of Louisville reported. A bill was introduced in the 2018 session to make sports betting an approved form of gambling in the state — there are already 15 riverboats and a land-based casino in New Orleans — and to provide for a referendum where voters in parishes could decide whether to allow it. The bill was rejected by the Senate Finance Committee in April over fears it constituted an expansion of gambling, The Advocate of Baton Rouge reported. Republican State Sen. Danny Martiny said he will reintroduce the bill in the next session. "I'm optimistic that something will pass in the next session," Martiny said. But as other states like neighboring Mississippi move quickly to legalize sports gambling, he said, "we’re behind everybody." A bill that would have used a referendum to decide whether the General Assembly could authorize agencies to offer licenses for sports betting cleared the House in March but stalled in the Senate, and the legislative session ended. Bills were introduced that would have legalized sports wagering on gambling boats if the federal ban was lifted. But the legislative session ended with the measures still in committee or otherwise without a full vote. Two Ohio legislators on July 12 introduced a bill that would be a precursor to a sports wagering bill, but it contains no information about how gambling would be allowed or where. One of the senators who introduced the bill, Sean O'Brien, a Democrat, told Cleveland.com that he would like to have more specifics in it by August or September. Ohio has four casinos, plus other racetrack casinos. Oklahoma lawmakers introduced bills that would have paved the way for Native American tribes to offer sports betting if the federal law changed, but the bills did not pass before the legislative session ended. Republican House Majority Floor Leader Jon Echols said he expects to consider a framework when the Legislature returns in February, The Associated Press reported in June. Some Democratic lawmakers introduced a bill in the House in 2017 that would have amended the state constitution to allow the General Assembly to provide for betting on professional sports, but the bill was still in committee when the session ended. The chances of another bill passing in a majority-Republican body are slim, Democratic Rep. Russell Ott told The Post and Courier newspaper in January. The following states and the District of Columbia do not appear to have any pending bills that would authorize sports betting. Lawmakers plan to introduce bills, or see that as likely. No bill to allow sports betting has been introduced, but Washington council member Jack Evans, a Democrat, said he is working on legislation with the mayor’s office and expects one to be introduced after the Council returns in September. Many details, like where bets could be accepted — the district has no casinos, so it could be as limited as at stadiums or as broad as being allowed in bars, and could include a mobile component, Evans said — are still up in the air, as is a proposed tax. Evans said that might be 10 percent. Congress would have to approve any law, but Evans said he sees it as unlikely that Congress opposes it. "We're venturing into the unknown, all of us are," he said recently. “So the question is how do you structure all of this and how do you make it work?" But "there's no question we’re all going down this road," he added, saying that if a bill is passed by the end of the year, Washington could get a jump on neighboring Maryland or Virginia, whose legislative sessions don't begin until early next year. Alabama's state constitution does not explicitly prohibit sports gambling, but the legislature would still need to pass a bill approving it, legal experts told AL.com in May. The earliest one could be filed would be in January when the new legislative session starts. Alabama is one of several states that does not have a lottery. Getting one approved would require an amendment that would need voter approval, according to AL.com. Gov. Bill Walker, a longtime Republican who is now an independent, has no plans to introduce a sports betting bill, and spokesperson Berett Wilber said the governor's office was unaware of any current legislative efforts. In Alaska, the governor can introduce legislation, but those bills must go through the House and Senate rules committees. After the Supreme Court ruling, Republican Gov. Doug Ducey tweeted that "this is positive news" and noted that the state was working on a modernized gaming compact with Native American tribes, who operate 24 casinos in the state. A spokesman for Ducey told Capitol Media Services in May that renegotiation of compacts with the tribes could include the right to take sports bets in exchange for a larger share to the state. The next legislative session starts in January. There are no pending bills to legalize sports betting in the state before the Legislature, and the earliest one could be filed would be late this year before the next legislative session, a spokesperson for Republican Gov. Asa Hutchinson said. It had been thought that legalizing sports betting might require a change to Colorado’s state constitution, which would need to go before a vote of the people. But on Aug. 2, state Attorney General Cynthia H. Coffman issued an opinion that legalizing sports betting would only require a statutory change. Lawrence Pacheco, communications director for the Colorado Department of Revenue, said that any bill to legalize sports betting wouldn’t be introduced until the next legislative session starts on Jan. 4. No bills appear to have been announced since the Supreme Court decision. Florida voters in November will decide on an amendment that, if approved, would give voters exclusive rights to decide whether to expand casino gaming in the state. Whether that, if it passes, would apply to sports gambling is unclear, The Orlando Sentinel has reported. It does not appear that any sports betting bills have been proposed since the Supreme Court ruling. The Macon Telegraph newspaper talked to gubernatorial candidates in June, and the Republican candidate who will appear on the ballot, Brian Kemp, said he does not support it, while the Democratic nominee, Stacey Abrams, indicated she is open to the idea but only if tax revenue goes toward education. Hawaii has no form of legalized gambling, not even a lottery. There do not appear to be any introduced bills to legalize sports betting in the state. There is no legislation in the works as far as the office of the governor is aware of, and the next legislative session begins in January, a spokesman for Republican Gov. Butch Otter said. There are two casinos in Maine, but the Legislature would have to authorize sports betting in the state. Milton F. Champion III, executive director of the gambling control unit for the state Department of Public Safety, said he is not aware of any bills that have been filed, and the new legislative session doesn’t start until January. State Rep. Louis Luchini, a Democrat, told The Portland Press Herald in May that he expects multiple bills on sports betting to be introduced in 2019. So far the effort in Massachusetts is to study legalized sports gambling. Democratic state Rep. Joseph Wagner told WGBY-TV in late May, after the Supreme Court's decision, that "I think the approach here is to move this to the front burner, but to not move so quickly that we get it wrong." There have been no bills proposed on sports betting since the Supreme Court ruling, but Republican state Rep. Pat Garofalo says he will introduce the first bill on sports betting since the Supreme Court ruling in the next legislative session that begins in January. The bill would legalize sports betting in person at tribal properties and the state’s two racetracks, and would also authorize mobile gaming to two licensees — likely companies that already have operations in Nevada — which would be required to partner with tribes with a 20-year exclusivity. The bill might include an "integrity fee," somewhere between 0.2 to 0.6 percent of the total "handle," or amount wagered, to be paid to leagues that monitor betting data for signs of unusual betting, he said. He said that he anticipates a very low tax rate to make up for any integrity fee and to not burden sports book operators. Montana was one of the states grandfathered in by the Professional and Amateur Sports Protection Act. The state lottery runs "Montana Sports Action," which consists of a fantasy football game as well as a fantasy game based on racing. To legalize more widespread sports betting, the Legislature would have to authorize it, and there have been no bills presented since the Supreme Court decision, said Angela Nunn, administrator for the state Gambling Control Division under the Montana Department of Justice. Gov. Pete Ricketts, a Republican, has said he would oppose any plans to change Nebraska’s laws, The Omaha World-Herald reported in May. It does not appear there are any planned bills announced. Democratic state Sen. Lou D’Allesandro told New England Sports Network in an article published in June that he was working with the state lottery commission to gauge opinion on sports betting. Gov. Chris Sununu, a Republican, quipped to USA Today Sports in May: "Legalized sports betting in New Hampshire? I’ll give it 3-1." Sports betting is illegal in New Mexico with the exception of horse racing, according to the New Mexico Gaming Control Board. Casino-style gaming is offered at tribal properties. No bills appear in the works, although state Rep. Antonio "Moe" Maestas, a Democrat, has said he will push for discussion on the issue, according to The Albuquerque Journal. The next legislative session starts in 2019. A bill to regulate fantasy sports — different from a bill on sports gambling — filed last year was defeated in a House committee. It does not appear that any bills to legalize sports betting have been proposed, and Senate President Pro Tempore Phil Berger, a Republican, suggested to The News & Observer newspaper in May that the state would take a slower approach than some others. It does not appear any bills are in the works, but state lawmakers could look at the issue next year, Forum News Service reported in June. State Rep. Andy Maragos, a Republican who pushed for legalizing a lottery in 2002, told the service in June that "I think it would have very minimal support." Oregon was also one of the states grandfathered in when the Professional and Amateur Sports Protection Act was passed, but betting on the outcomes of sports games was limited — Sports Action, a parlay game, was introduced in 1989, and another game, Scoreboard, was introduced in 2003. Both games were ended in 2007 at the request of the state Legislature. Sports Action was suspended because of pressure from the NCAA, which did not want to host men’s basketball events in the state while sports gambling was in place, Lottery spokesperson Chuck Baumann said this week. The Lottery does not need the Legislature to pass a law in order to bring back sports-based games, but so far there are only plans, perhaps in 2019, to introduce a virtual sports game that would not be based on real teams or games, and which rely on randomly generated numbers, Baumann said. "We're proceeding very cautiously," he said. Whatever happens in the future, "chances are the state of Oregon would not have a game that would have any type of collegiate elements to it" and would instead be based on professional sports, Baumann said. The state attorney general said in a statement after the Supreme Court decision that the state constitution would have to be changed to begin the process of legalizing sports betting, and both methods for doing so would require the approval of voters. Then the Legislature would need to pass a bill regulating sports gambling. Tennessee does not currently have casino gambling. State Rep. Jason Powell, a Democrat, said recently that he plans to introduce a bill next year that could allow for sports gaming, which he believes is a game of skill and thus allowable under the state constitution without an amendment. Texas allows some forms of gambling, but sports betting is not one. The Texas Legislature would have to change state law and would likely need to change the state constitution to allow it, the Austin American-Statesman reported. A representative for Gov. Greg Abbott, a Republican, did not immediately respond to a request for comment. State Rep. Eddie Lucio III, a Democrat, said in May he's drafted a bill to legalize sports betting in the state, according to NBC affiliate KXAN of Austin. The legislative session resumes in January. Utah is another state with no form of legalized gambling. The Salt Lake Tribune noted at the time of the Supreme Court's decision that lawmakers have repeatedly declined to allow gambling in the state, and state Sen. Todd Weiler, a Republican, told the newspaper that "Utah has a long history of deciding that they don’t want gambling" and "I don’t see that changing soon." In May, Vermont Gov. Phil Scott, a Republican, said at a press conference that sports betting is "not the answer to Vermont's fiscal issues" but added "I'm willing to listen," according to The Burlington Free Press. There were no bills pending on the issue, and the executive director of the state lottery told the paper, “I don't know of anybody who is pushing for this in Vermont." It does not appear any bills have been proposed, but Virginia’s secretary of finance, Aubrey Layne, predicted at a July lottery meeting that "you’re going to see a big push in the General Assembly session, probably the beginning of this year," according to The Virginia-Pilot newspaper. Gov. Ralph Northam, a Democrat, "believes any future proposal to expand sports gaming here in Virginia should be considered with the input of the General Assembly and the communities that will be impacted in order to fully assess the benefits and potential consequences for existing industries and businesses," a spokesperson said in an email. Sports betting in Washington state is prohibited under state law, and would require a vote by the Legislature to authorize it, according to the Washington State Gambling Commission. A spokesperson for the commission said they are not aware of any proposed legislation. Sports betting is prohibited by the state constitution and state law, and sports betting is also not allowed under state tribal compacts. There are no pending bills to legalize sports betting in the state, and amending the state constitution would require a vote by the people, a spokesman for the state Department of Administration said. It does not appear that any bills have been introduced or proposed to legalize sports betting in Wyoming. State Sen. Drew Perkins, a Republican, told NBC affiliate KCWY of Mills in May that he is considering trying to establish a gaming commission to see how much gambling is already occurring in the state, which has reservation casinos and limited lottery games. The next legislative session won't start until next year. CORRECTION (Aug. 13, 2018, 3 p.m. ET): An earlier version of this article misstated in a headline when the Supreme Court overturned a law prohibiting states from legalizing sports betting. It was three months ago, on May 14, not two months ago. CORRECTION (Aug. 14, 2018, 4:13 p.m. ET): An earlier version of this article misstated the procedure necessary to legalize sports betting in Colorado. Legalizing sports betting would require a state statutory change, not a constitutional amendment, according to an Aug. 2 opinion by state Attorney General Cynthia H. Coffman. On Aug. 17, Hollywood Casino at Penn National Race Course near Harrisburg became the first casino to submit a petition to request offering sports wagering, a gaming control board spokesperson said, but it appears that sports bets will not be taken there before the start of the NFL regular season. The Pennsylvania Gaming Control Board’s next meetings are Sept. 12 and Oct. 3. Pennsylvania has a relatively high tax on sports gambling — 34 percent on operators’ revenue plus a 2 percent tax that goes for local grants to counties, as well as a onetime fee of $10 million.